Low price 1000w modified sine wave car power inverter to charge laptop, Xbox 360 etc. Convert 12v DC to 110v, 120v, 220v AC power supplies, the best solution for your moveable life. 1000w power inverter for car, charging your electronic devices, like laptop, Xbox 360 etc. Tips: How to select a suitable car power inverter base on the battery? If the capacity of the battery is 12v 100Ah, using 12v multiply by 50Ah to obtain battery output power 1200 watt. If the efficiency of the inverter is 85%, then using 85% multiply by 1200 watt, obtain approx 1000 watt. That means this battery can drive a maximum 1000w inverter. Of course, you can buy the car power inverter first, like 1000 watt, with regardless of the current battery specification, it's enough to charge a laptop, use it within the allowable range of the battery or make it in full power operation when buy a bigger car/battery. Finally, for small capacity appliances which do not require big power, such as 100 watt, then we can just buy a small power inverter totally. 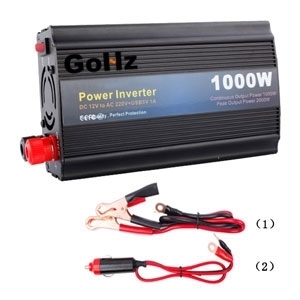 Furthermore, there is an important principle to select the size of a car power inverter, that is, when using a car power inverter, do not make it in full load operation for long term, which would shorten the life of the car power inverter significantly, and the car inverter failure rate will rise significantly. We strongly recommend, it is best to use a car power inverter at not more than 85% of its rated power capacity.